lls for the residential school legacy, treaties and past and present Indigenous contributions to this country to be a mandatory part of the curriculum in each province and territory. Visit KAIROS’ website for more information and updates about the campaign. On March 30, 2016, eight churches and religious organizations jointly declared their commitment to the Truth and Reconciliation Commission of Canada’s (TRC) Call to Action #48 in a press conference on Parliament Hill. This call urges the faith community to implement the principles, norms and standards of the United Nations Declaration on the Rights of Indigenous Peoples as a framework for reconciliation. 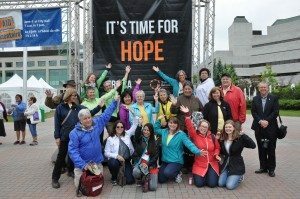 The Presbyterian Church in Canada will continue to consult with other denominations and consult with National Native Ministries and with Presbyterians involved in healing and reconciliation about how to live out Call to Action #48. Click here for more information and to read the ecumenical statement issued on March 30, 2016. The UN Declaration on the Rights of Indigenous Peoples became part of international law when it was adopted by a majority vote of the UN General Assembly on September 13, 2007. It took over 20 years to negotiate. Canada initially voted against the Declaration but on November 12, 2010, Canada issued a Statement of Support endorsing it. The UN Declaration is the only human rights instrument created with the participation of rights holders (in this case Indigenous Peoples) themselves. Prominent Indigenous people in Canada were involved in drafting the Declaration. The UN Declaration sets the minimum necessary threshold to meet international human rights standards. States are free to apply higher standards or stronger rights than those set out in the UN Declaration. It does not create new or special rights for Indigenous peoples but elaborates upon existing international human rights instruments and clarifies how those rights apply to Indigenous peoples given their “specific cultural, historical, social and economic circumstances.” (Understanding and Implementing the UN Declaration on the Rights of Indigenous Peoples: An Introductory Handbook, Indigenous Bar Association and the University of Manitoba, Faculty of Law, 2011). Indigenous Peoples constitute about 5% of the world’s population. There are some 370 million Indigenous people in the world, belonging to 5,000 different groups, in 90 countries. According to the 2011 Canadian National Household Survey, there was a total of 1,400,685 Indigenous or Aboriginal people in Canada, comprising 4.3% of the Canadian population. There are three Indigenous groups recognized in Canada’s Charter of Rights and Freedoms: First Nations (851,560), Métis (451,795) and Inuit (59,445). The forum took place on Wednesday, January 20, 2016 and was hosted by the Beth Tzedec Synagogue in Calgary. The day was led by Elder Doreen Spence, a Cree Storyteller and Healer who has dedicated her life to advancing Indigenous rights in Canada, and a 2005 Nobel Peace nominee for her 1000 Women of Peace project. 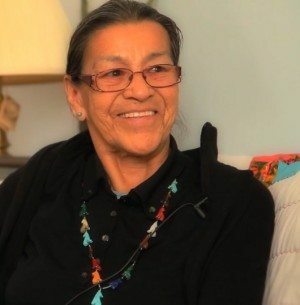 A sacred run through Europe to the doors of the United Nations in Geneva began the long 20-year journey, led by Elder Doreen Spence, of drafting and revising the document that would eventually become The United Nations Declaration on the Rights of Indigenous Peoples. Watch Doreen tell her empowering story, https://vimeo.com/54259728. A Global Search for Justice. The Story of Doreen Spence. Repudiate those concepts that have been used throughout history to justify sovereignty over Indigenous lands and peoples. 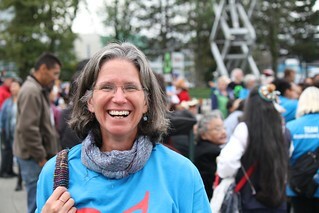 to respect Indigenous spirituality in its own right, the history and legacy of residential schools and the roles of the church parties in that system, the history and legacy of religious conflict in Aboriginal families and communities, and the responsibility that churches have to mitigate such conflicts and prevent spiritual violence. ii. Community-controlled culture- and language-revitalization projects. iii. Community-controlled education and relationship-building projects. Provide to our members ongoing education on the Church’s role in colonization and Indian Residential Schools. Develop and sign a Covenant of Reconciliation with other parties to the Settlement Agreement. Provide permanent ongoing funding for projects that promote Indigenous healing and reconciliation, culture, language and spirituality. With Indigenous groups and the Federal Government, support initiatives to provide a registry of children buried at schools, notify families, and properly maintain cemeteries. an online registry of residential school cemeteries, including, where possible, plot maps showing the location of deceased residential school children. commemoration, and protection of residential school cemeteries or other sites at which residential school children were buried. This is to include the provision of appropriate memorial ceremonies and commemorative markers to honour the deceased children. The seventh and final national Truth and Reconciliation Commission event was held in Edmonton, AB in March 2014. The moderator offered a gesture of reconciliation at the Edmonton event. Learn more about how the final TRC event provided an opportunity to help survivors and their families move forward toward freedom from pain and suffering. 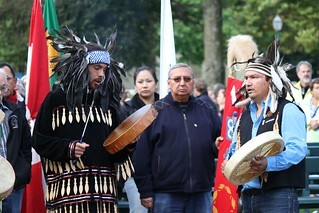 The national events provide a chance to celebrate diversity and honour those touched by residential schools. They engage the public and provide education about the history of the residential schools system, the experience of former students and their families, and the ongoing legacies. We are on a journey toward reconciliation. Justice Ministries commends KAIROS’ Strength for Climbing: Steps on the Journey of Reconciliation to all churches as a resource for steps that faithfully respond to the Truth and Reconciliation Commission’s 94 Calls to Action (to churches, governments and all Canadians). Strength for Climbing provides concrete suggestions for individual and group learning activities pointing to why reconciliation is essential and suggested activities for how we can continue this journey together with Indigenous people. 1. Identify the traditional territory your church is on. Talk to session about acknowledging the traditional territory in your church’s bulletin. 2. Read Thomas King’s The Inconvenient Indian. 3. Do the Blanket Exercise. 4. Support “Sisters in Spirit” as they call for a national inquiry into missing and murdered Indigenous women and girls. Little did I know how attending two national TRC events would affect my life. I was one who would wonder, sometimes out loud, “why don’t Aboriginal peoples just let things go and get on with their lives?” Why did something that happened some generations ago have such a negative effect on their way of life? I first attended a TRC national event in Saskatoon SK in June 2012 as a member of the Women’s Missionary Society’s delegation. We were there to hear the experiences and stories of survivors of residential schools and their families. After listening to these heart-rending stories, my attitude changed. I realized that we were there to grieve the past with them, ask for forgiveness and break down barriers. We often listened through tears, along with the survivors and others who attended. It was difficult to hear about the “take the Indian out of the child” policy. It was difficult to hear how they were referred to as savages and that their way of life was not considered human. It was difficult to hear how the children felt abandoned, and about the physical, emotional, spiritual and sexual abuse suffered by many. At the Saskatoon and Montreal TRC (which I also attended) events, we witnessed extraordinary courage by the survivors and their families as they spoke publicly about what they had suffered. Many survivors spoke about not knowing how to love their own families after being deprived of love themselves. Some survivors said that if it had not been for supportive partners and families in later years, they would not have survived. That some survivors continued in a Christian faith, after being told that their experiences at residential school were “God’s way,” amazes me. Many were told that the God they believed in was not the true God. It was amazing how some of them, in their statements before the Commission, expressed their love for God and how they were able to continue living with God’s help. Attending the TRC national events changed my life and perspective while I witnessed the simple truths of the Sacred Fire and the resilience of survivors who carry on. View the photo gallery from the TRC national event in Edmonton. View the photo gallery from the TRC national event in Saskatoon. View the Presbyterian Archives online photo exhibit from the Indian Residential Schools. The Confession of 1994 (English/French/Korean): presented to First Nations peoples at the Forks national site in Winnipeg on October 8, 1994. Download the confession with all translations included. Gently Whispering the Circle Back. The story of the emergence of Blue Quill College in St. Paul as a place of healing and reconciliation. Contact Beth Wishart MacKenzie (producer) to arrange a screening or obtain a copy. Project of Heart website full of resources for all ages to learn about residential school history using a variety of materials and strategies. United Church of Canada website is full of information and resources to use within congregations. The Children Remembered is a website that has all the photos and history summaries of United Church operated residential schools. The Aboriginal Healing Foundation website is where you can order the book, Speaking My Truth, for free. The website of KAIROS Canada has resources and workshop support for indigenous rights. Coordinating of and information sharing on events across Canada. Outline for a Workshop: for commemorating the anniversary of the confession to Aboriginal peoples.